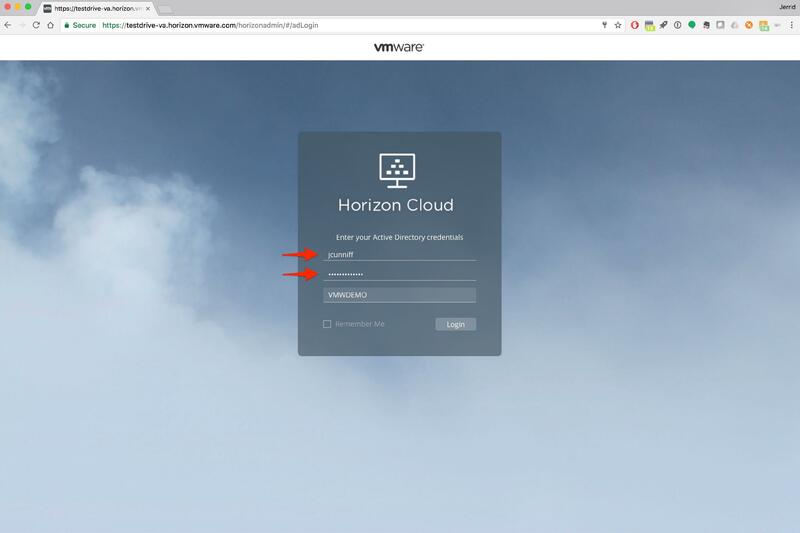 Once you've logged in, click on LAUNCH SERVICES, then under Horizon Cloud with Hosted Infrastructure, click on Admin Console. 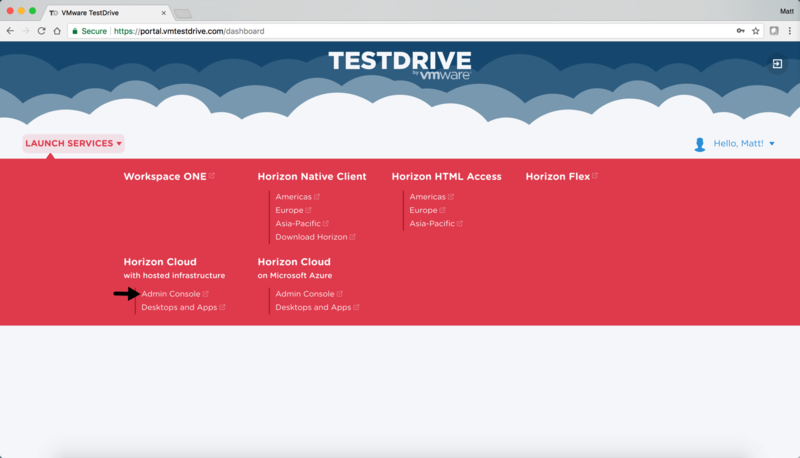 You will be directed to the Horizon Cloud Administration Console in a separate browser window, login with your Testdrive credentials making sure the domain is set to "VMWDEMO". Once logged in you will land on the Getting Started page. 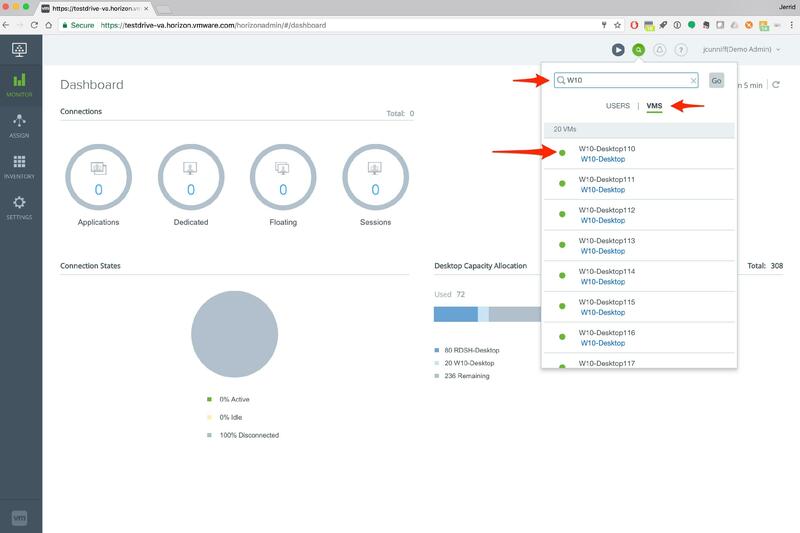 This provides a step by step walkthrough in setting up the Horizon Cloud environment. Select the different sections such as Desktop Assignment and App Assignment in order to see the the applicable steps. 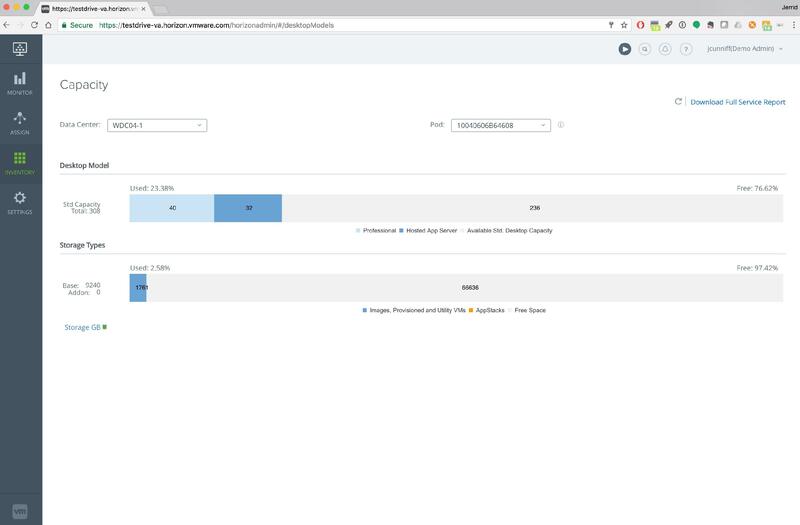 Now, let's look at the Dashboard, from the left navigation pane click on "Monitor" then select "Dashboard". 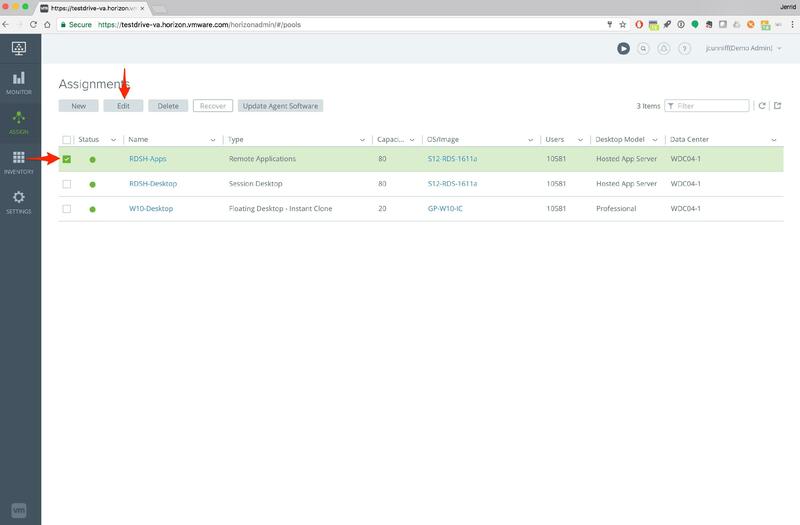 The Dashboard displays the current active connections for Applications, Dedicated, Floating or Session based Assignments, along with Connection States and current Capacity. Let's try checking out the search and looking up some Users and VMs. Click on the "Search" icon. Type your username, ensure "USERS" is elected and see the real time results list populate. Select your username. Close this window and click search again, this time select the "VMS" option and search for a running VM such as "W10". 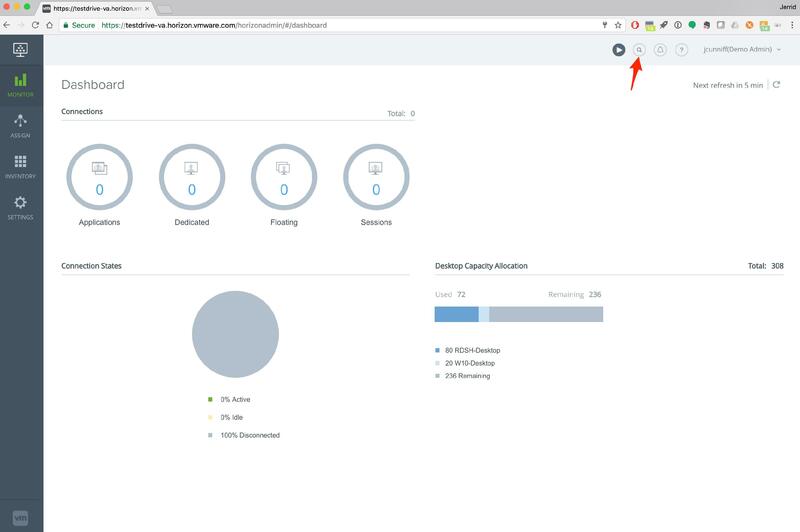 Click on one of the VMs displayed. The resulting VM will be displayed. 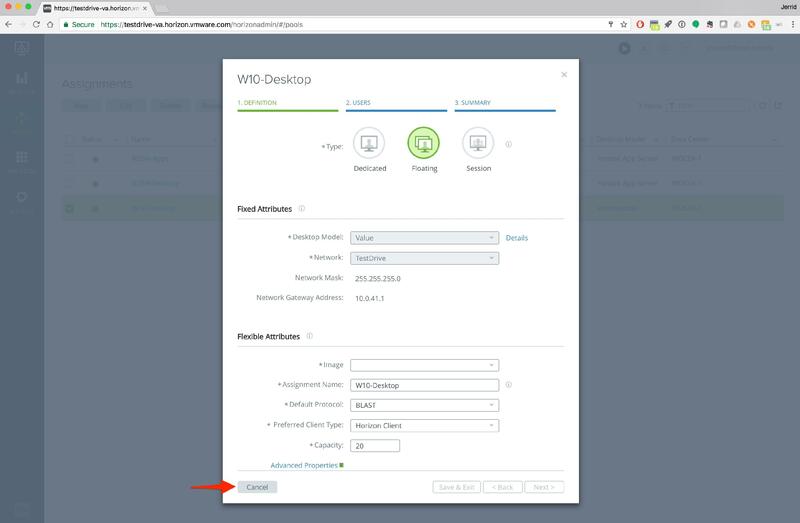 Select the VM and then the ellipsis button to show the available actions to perform. 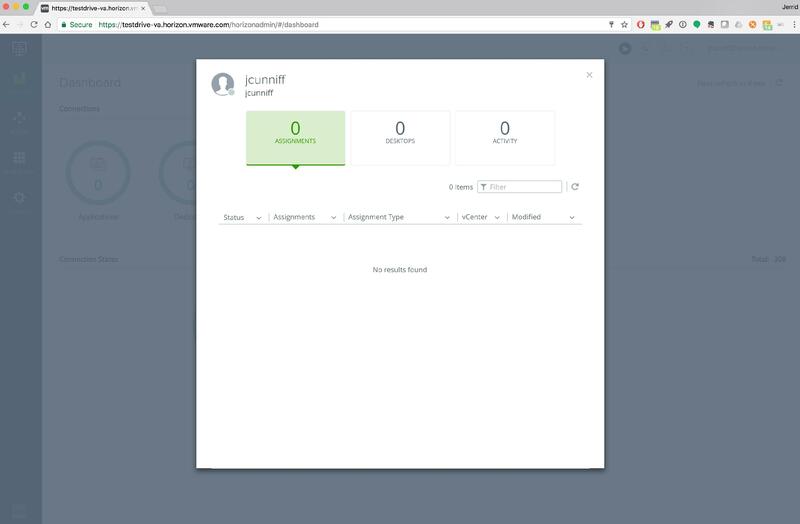 Select "Summary" to see the assignment information. 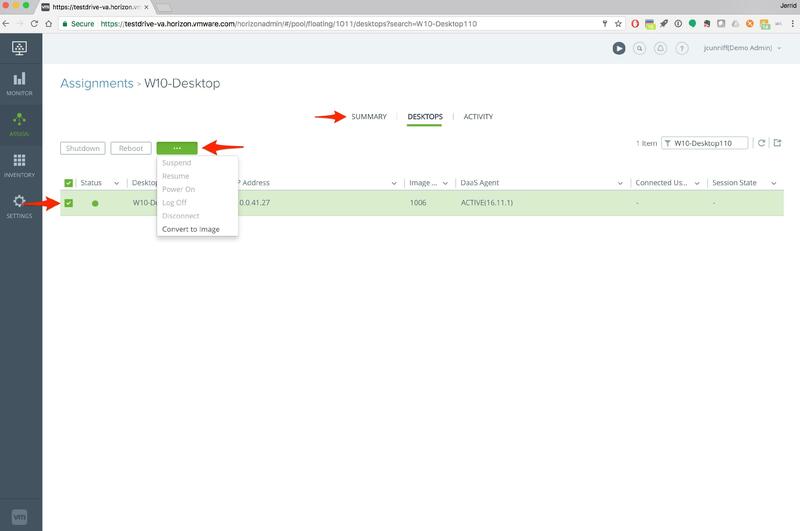 The Summary page displays information about the current Assignment, such as Default Protocol, Image Type, Desktop Model, Capacity, Image and Users Assigned. From the left navigation pane, click on "Assign". The Assignments page lists the current Desktop and Application Assignments. Select an Assignment, such as the Windows Floating Desktop, and click "Edit". The settings page for the Assignment opens. Take a look at the different settings that can be set such as Desktop Type, Model, Network, Assignment Name, Protocol, Capacity, etc. After reviewing it, click "Cancel". Select the Remote Applications Assignment and click "Edit". The settings page for the Assignment opens. 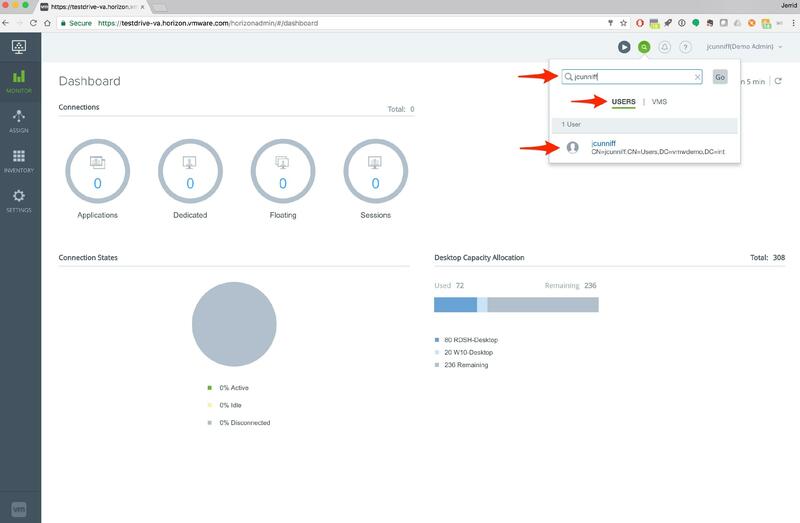 Take a look at the different settings under Definitions that can be set such as Network, Assignment Name, Protocol, Servers, etc. After reviewing it, click "Next". This page shows the Applications that are available to be entitled and presented to end users. Click "Next". This page shows Users that are available to be entitled to the Assignment by searching Active Directory for Users/User Groups. The current entitlement is listed under the Selected Users/User Groups. Click "Cancel". 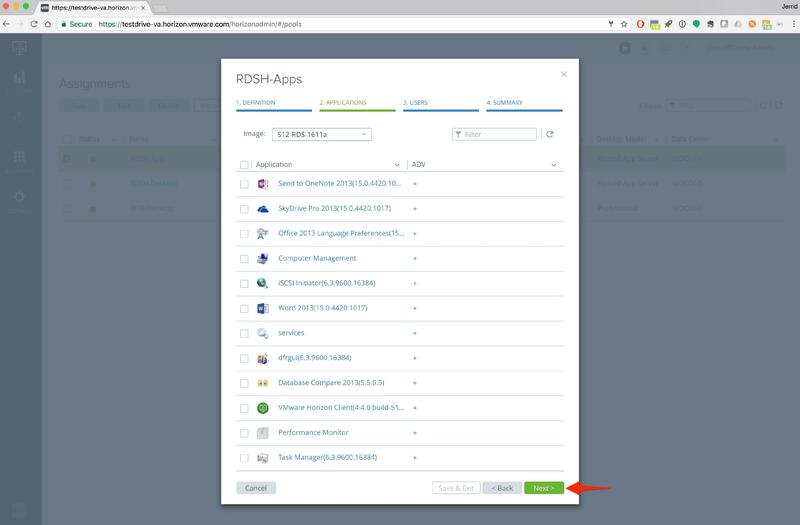 Once you are finished here, from the left navigation pane, click on "Inventory" and then select "Applications". The list of the currently available Applications are displayed. 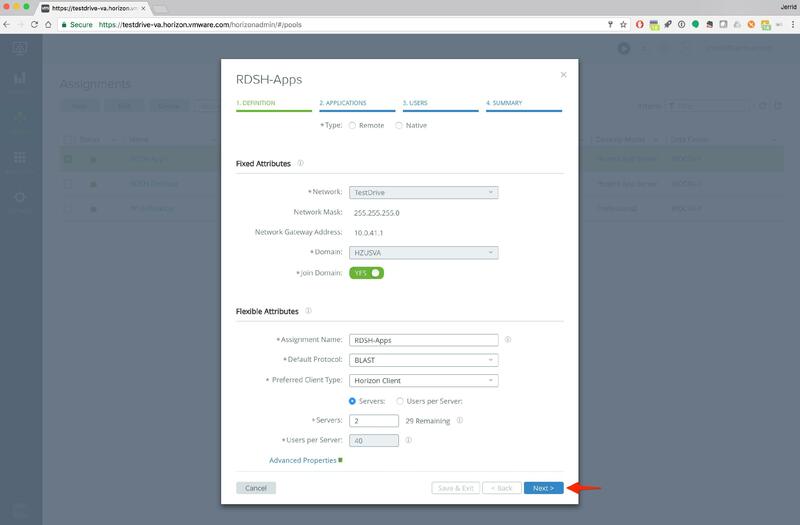 These are auto populated from the Image used to create the RDSH Server(s). 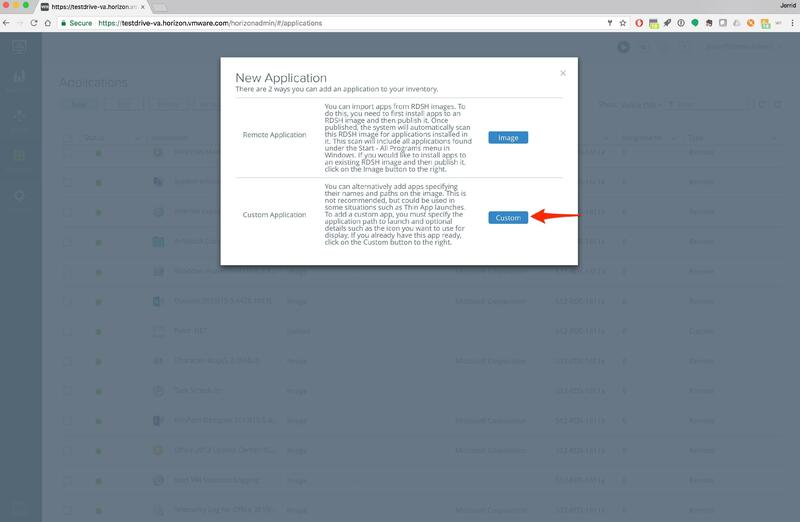 To create a new Application, specifically a Custom Application, select "New". The two types of Applications are displayed. 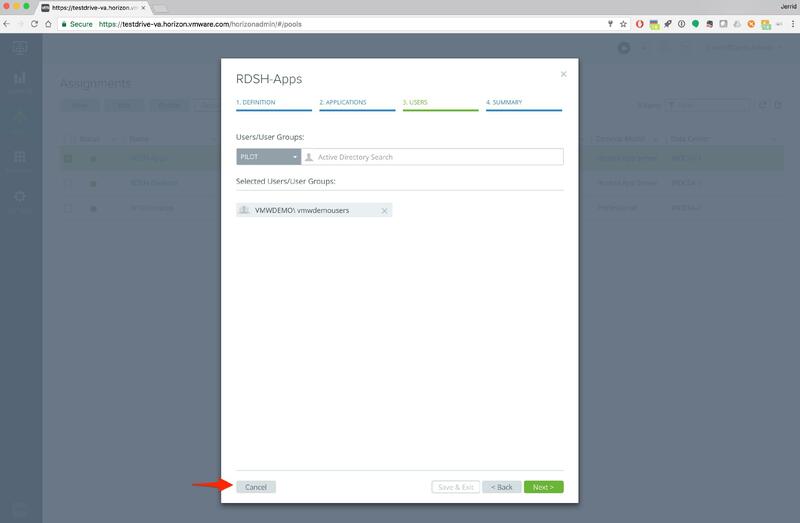 Select "Custom" for a custom application. 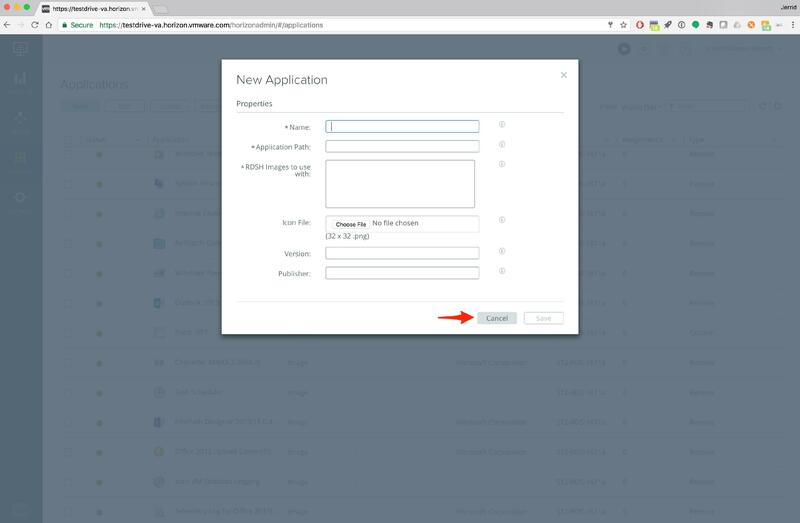 The New Application window opens. 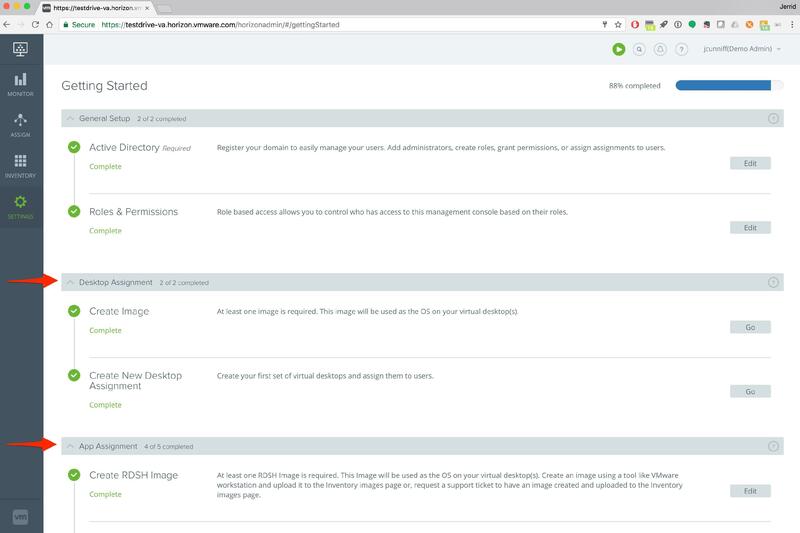 Take a look at the different configuration settings for creating a Custom Application. Once done click "Cancel". Once you are finished here, from the left navigation pane, click on "Inventory" and then select "Images". The available images in the environment are displayed. These could be images for Desktops and RDSH Servers. Once you are finished here, from the left navigation pane, click on "Inventory" and then select "Capacity". The Capacity page displays the current capacity of the environment. It shows how much Standard Desktop Capacity is being used based on what has been provisioned along with how much is available. That's a logical place to stop, let's have a quick recap of what happened!